DETROIT -- Intel, which announced plans in August to build a fleet of 100 self-driving cars, is preparing to roll out its first batch of 25 units this year in California and Phoenix. The Santa Clara, California-based computer chipmaker has been supplying processors for Waymo’s self-driving vehicles. But this will be Intel’s first large-scale test of its advanced Xeon processor -- which will pick each vehicle’s route -- paired with Mobileye’s EyeQ chip, which will analyze sensor data to map the road. 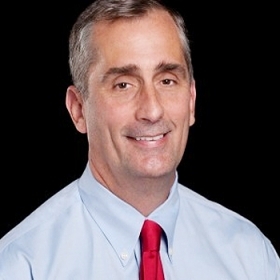 Intel CEO Brian Krzanich described Intel’s plans Friday during an interview in Detroit with Automotive News. Intel will introduce batches of 25 vehicles each quarter until 100 cars are deployed in the United States, Europe and Israel. Mobileye, which Intel acquired earlier this year for $15 billion, is based in Jerusalem. The fleet will include models from nearly every major automaker, Krzanich said. Each car will have a mix of cameras, radar and lidar. The fleet will be the key to Intel’s budding campaign to prepare the public for self-driving vehicles. While the vehicles will not be used as robo-taxis, Intel plans to hold public events to allow journalists and local residents to go for rides. This month, Intel also kicked off a TV campaign -- dubbed "Driving Trust" -- that featured basketball star LeBron James in a self-driving car. Meanwhile, a top Intel executive has called for industrywide adoption of a standard “do-no-harm” software program to ensure safe operation of self-driving cars in mixed traffic. Mobileye founder Amnon Shashua, who currently runs Intel’s automated vehicle group, proposed the industrywide safety standard on Oct. 10. Krzanich said he has gotten good feedback. The next step will be to launch a dialog of automakers, suppliers and regulators.